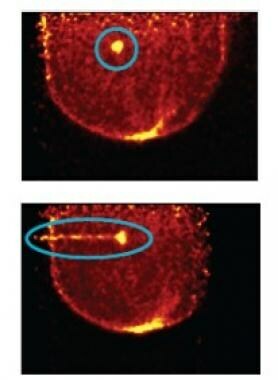 Breast PET typically utilizes the radiotracer F-18 fluorodeoxyglucose (F-18 FDG) to image glucose metabolism [10, 11] ; however, other radiotracers are under development. Whole-body PET cameras are typically combined with a CT scanner to allow acquisition of anatomic and molecular information from a single procedure. These hybrid PET/CT cameras are donut-shaped. During the procedure, the patient is passed through the central hole of the camera. PET/CT cameras have the detector several centimeters away from the body surface, which limits scan resolution. While PET/CT cameras are useful for whole-body imaging, breast-specific PET imaging, known as positron emission mammography (PEM), requires the PET camera to be configured like a mammography machine. PEM cameras utilize two small movable flat detectors that are pressed directly against the breast. Grade III multifocal infiltrating ductal carcinoma as seen on F-18 fluorodeoxyglucose positron emission tomography . 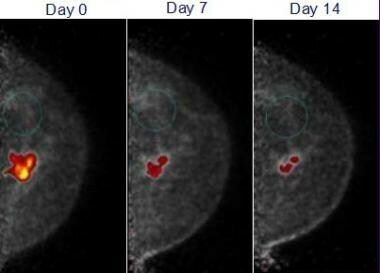 This organ specific positron imaging technique results in a much higher resolution (down to 1 to 2 mm) compared to whole body PET/CT imaging. Positron emission mammography (PEM) is particularly useful when other imaging scan results are indeterminate. It has a useful complementary role to mammography, ultrasonography, and MRI. PEM can assist in presurgical planning in breast cancer, monitoring response to therapy, and evaluating for tumor recurrence. In some cases, it may be useful in breast cancer staging and in helping guide breast biopsies. 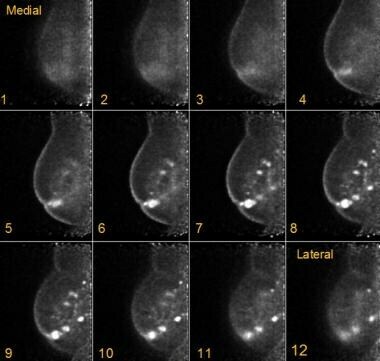 This image shows the ability of positron emission mammography to help ensure a breast biopsy is taken in the best location. The most metabolically active tissue needs to be evaluated for malignancy. The top image is obtained right before performance of the biopsy. The bottom image shows the biopsy needle to be properly positioned. Because F-18 FDG releases radiation, caution is urged when using in pregnant women or in nursing mothers. Women who are pregnant or breastfeeding will only rarely undergo a nuclear medicine procedure such as F-18 FDG PEM. Although F-18 FDG PEM has not been shown to cause any harm to the fetus or breastfeeding infant, caution is urged. For pregnant women in whom the benefits of PEM are thought to greatly outweigh any potential risks, the physician may modify the dose of the radiotracer. Women who are breastfeeding typically will stop breastfeeding for an hour or two after the PEM scan has been completed. After this, breastfeeding is resumed as normal. Although very rare, hypersensitivity allergic reactions to the radiotracer can occur. Eo JS, Chun IK, Paeng JC, Kang KW, Lee SM, Han W, et al. Imaging sensitivity of dedicated positron emission mammography in relation to tumor size. Breast. 2012 Feb. 21(1):66-71. [Medline]. Berg WA, Weinberg IN, Narayanan D, Lobrano ME, Ross E, Amodei L, et al. High-resolution fluorodeoxyglucose positron emission tomography with compression ("positron emission mammography") is highly accurate in depicting primary breast cancer. Breast J. 2006 Jul-Aug. 12(4):309-23. [Medline]. Paydary K, Seraj SM, Zadeh MZ, Emamzadehfard S, Shamchi SP, Gholami S, et al. The Evolving Role of FDG-PET/CT in the Diagnosis, Staging, and Treatment of Breast Cancer. Mol Imaging Biol. 2018 Mar 7. [Medline]. Dai D, Song X, Wang M, Li L, Ma W, Xu W, et al. Comparison of Diagnostic Performance of Three-Dimensional Positron Emission Mammography versus Whole Body Positron Emission Tomography in Breast Cancer. Contrast Media Mol Imaging. 2017. 2017:5438395. [Medline]. [Full Text]. Yamamoto Y, Ozawa Y, Kubouchi K, Nakamura S, Nakajima Y, Inoue T. Comparative analysis of imaging sensitivity of positron emission mammography and whole-body PET in relation to tumor size. Clin Nucl Med. 2015 Jan. 40 (1):21-5. [Medline]. Shimada H, Setoguchi T, Yokouchi M, Sasaki H, Ishidou Y, Kawamura I, et al. Metastatic bone tumors: Analysis of factors affecting prognosis and efficacy of CT and 18F-FDG PET-CT in identifying primary lesions. Mol Clin Oncol. 2014 Sep. 2(5):875-881. [Medline]. [Full Text]. Pires AO, Borges US, Lopes-Costa PV, Gebrim LH, da Silva BB. Evaluation of bone metastases from breast cancer by bone scintigraphy and positron emission tomography/computed tomography imaging. Eur J Obstet Gynecol Reprod Biol. 2014 Jun 28. [Medline]. García Vicente AM, Cruz Mora MA, León Martín AA, Muñoz Sánchez MD, Relea Calatayud F, Van Gómez López O, et al. Glycolytic activity with 18F-FDG PET/CT predicts final neoadjuvant chemotherapy response in breast cancer. Tumour Biol. 2014 Aug 20. [Medline]. Ogino K, Nakajima M, Kakuta M, Hayashi M, Yamaguchi S, Tsuchioka T, et al. Utility of FDG-PET/CT in the Evaluation of the Response of Locally Advanced Breast Cancer to Neoadjuvant Chemotherapy. Int Surg. 2014 Jul-Aug. 99(4):309-18. [Medline]. [Full Text]. Marti-Climent JM, Dominguez-Prado I, Garcia-Velloso MJ, Boni V, Peñuelas I, Toledo I, et al. [18F]fluorothymidine-positron emission tomography in patients with locally advanced breast cancer under bevacizumab treatment: Usefulness of different quantitative methods of tumor proliferation. Rev Esp Med Nucl Imagen Mol. 2014 Jul 22. [Medline]. Göktaş İ, Cayvarlı H. The Role of 18F-FDG PET/CT in Evaluating Elevated Levels of Tumor Markers in Breast Cancer. Mol Imaging Radionucl Ther. 2018 Feb 1. 27 (1):3-9. [Medline]. [Full Text]. Fludeoxyglucose F18 [package insert]. PETNET Solutions, Inc. 2011. Available at [Full Text]. Kalinyak JE, Schilling K, Berg WA, Narayanan D, Mayberry JP, Rai R, et al. PET-guided breast biopsy. Breast J. 2011 Mar-Apr. 17(2):143-51. [Medline]. Satoh Y, Nambu A, Ichikawa T, Onishi H. Whole-body total lesion glycolysis measured on fluorodeoxyglucose positron emission tomography/computed tomography as a prognostic variable in metastatic breast cancer. BMC Cancer. 2014 Jul 21. 14:525. [Medline]. Kitajima K, Miyoshi Y, Yamano T, Odawara S, Higuchi T, Yamakado K. Prognostic value of FDG-PET and DWI in breast cancer. Ann Nucl Med. 2018 Jan. 32 (1):44-53. [Medline]. Moadel RM. Breast cancer imaging devices. Semin Nucl Med. 2011 May. 41(3):229-41. [Medline]. Schilling K, Narayanan D, Kalinyak JE, The J, Velasquez MV, Kahn S, et al. Positron emission mammography in breast cancer presurgical planning: comparisons with magnetic resonance imaging. Eur J Nucl Med Mol Imaging. 2011 Jan. 38(1):23-36. [Medline]. [Full Text].